Project: This poster was created as an educational piece for Earth Science Week on the theme “Connected Systems”. It illustrates the connections between the geosphere, hydrosphere, biosphere, and atmosphere using the lower Columbia River region as a unifying theme. 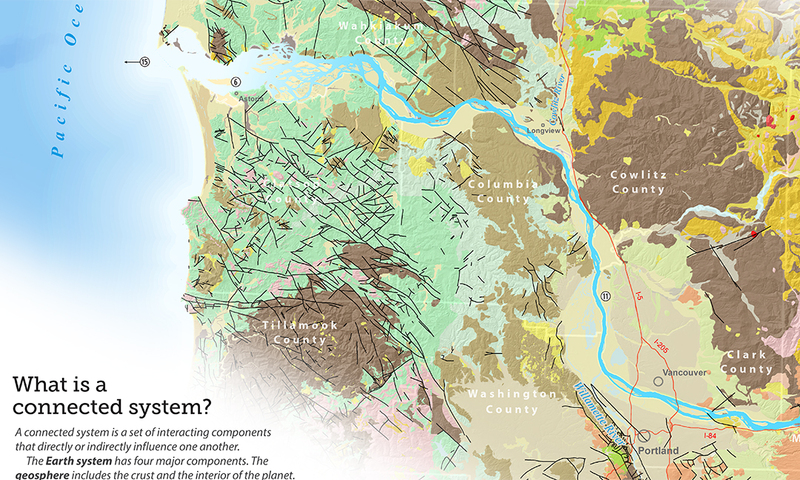 The accompanying thematic geology map is used as a discussion piece to show how geology can affect and can be affected by the different connected systems. The poster was a joint project between the Oregon Department of Geology and Mineral Industries and the Washington State Department of Natural Resources, Geology Division. Here is a pdf of the full-size poster.